Tokyo-X Pigs are a new Japanese hybrid premium-quality pig breed. They were well known for its marbled meat, seldom seen in pork. 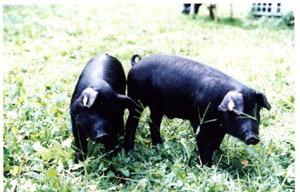 The Tokyo-X breeding effort was begun in 1990 by the Tokyo Metropolitan Livestock Experiment Station, combining bloodlines from the Duroc (USA), Berkshire (UK), and Beijing Black (China) breeds. Five generations of breeding and selection ended in 1997 when the breed went to market. Tokyo-X Pig meat was featured on the Japanese television program Iron Chef, where the cooks had to use it as an ingredient in each of their dishes.